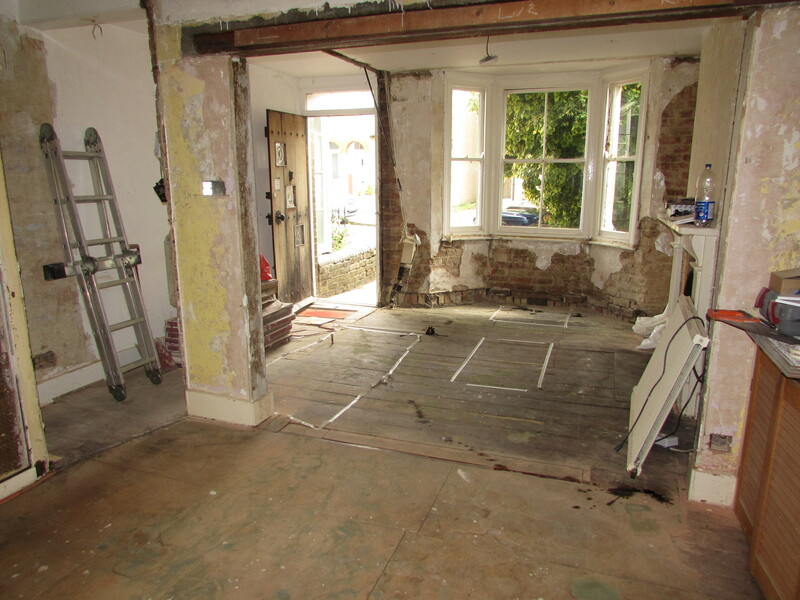 The first on site activity of any property development is the ‘rip out’ stage. You need a mixture of muscle, structural knowledge and guts. Most of the problems of the entire project will come out during this stage, so you have to be prepared to make some difficult calls, change your plans and take a few deep breaths. When you first purchase a house, if you’re cautious like me, you will most likely have had a structural survey done. This enables you to try and second guess and plan around any disasters that may raise their ugly heads. However often the worst problems are the best hidden which is something I’ve certainly been reminded of this week. It’s fair to say I’ve never encountered quite so many problems in the first week, let alone the first three hours, as I have on my own house. I have had to completely redo my previous electrical, lighting, kitchen, living room and bathroom plans, all within the space of a few hours, to compensate for quite so many nightmares. Luckily for me I’m able to be on site daily to tackle each issue with the relevant contractor and I have accepted that my social life will be over for at least the next 6 weeks. Our first issue was probably the scariest but luckily it was the easiest to resolve. 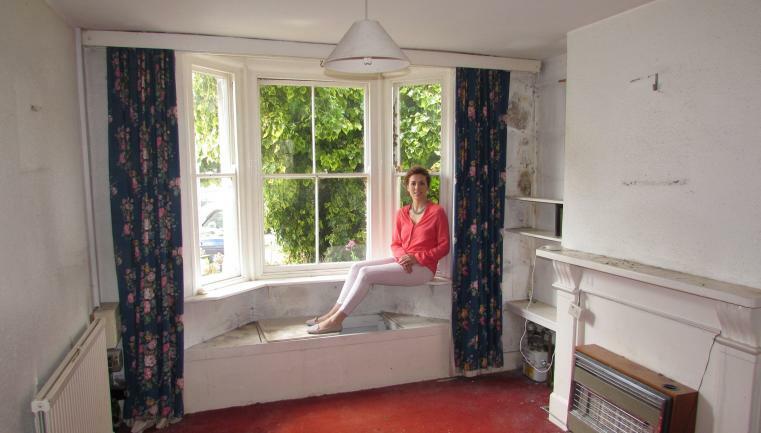 When we removed the window seat and ledge from the bay window in the front reception room, the plaster crumbled in our hands dislodging the existing brickwork which holds the whole house up. To make matters worse, somewhere along the line someone had made the bad call to swap out the original bricks with wooden blocks. This is when having a good builder or bricky on site is imperative, as what looks like a disaster to you may have a simple and cost effective solution. 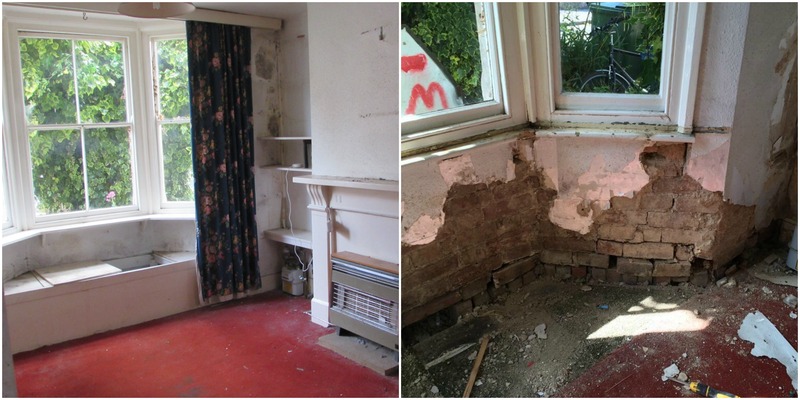 After replacing the wooden blocks with bricks, we will re-plaster using fibre glass mesh for added support. The next problem to tackle was a well hidden chimney stemming from the kitchen, up through the back of the water tank in the first floor bathroom and finishing on the roof shared with our next door neighbour. When I first saw the chimney in the kitchen, I wrongly assumed it would be easily removed, and I definitely wouldn’t have predicted needing party wall agreements or steels to support the structure. I planned both the kitchen and bathroom on this wrong assumption, making this unexpected problem a serious nuisance. Once we had removed the old water tank in the shower, it became clear that if I wanted the chimney gone in the kitchen, it would need to be removed top to bottom. I then looked into the time and costs involved to do this with a local structural engineer, and decided that it just was not worth our while. 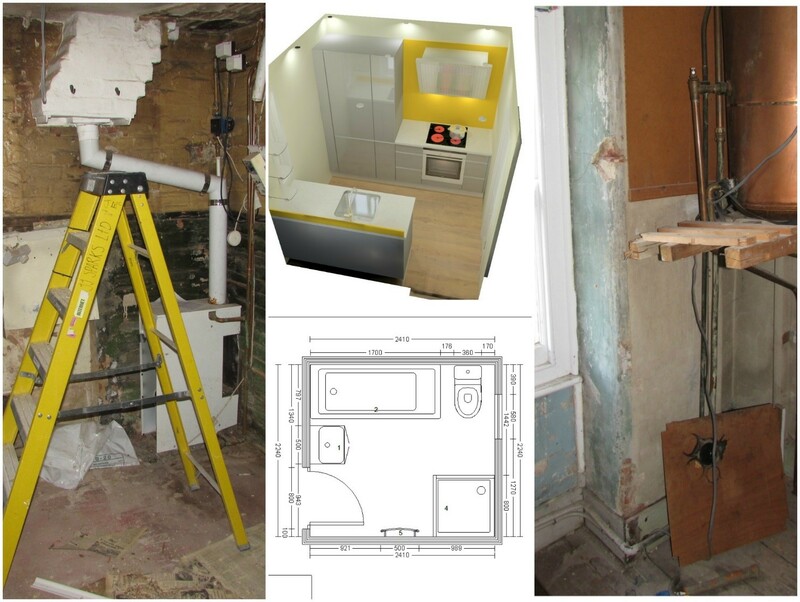 Instead I redesigned the kitchen and bathroom to work around the existing structure with the use of extra panel and plaster boards, losing just 200mm from both designs. As our roof had received a number 1 rating (GOOD) by a local RICs surveyor ,we felt confident that this was one aspect of the house we wouldn’t encounter any problems with. However as we were ripping out the existing bathroom, the timber joist started to crumple away. There was a tiny gap in the joinery between the new extension and the original house which enabled water to seep through into the roof’s beams. Once we started ripping out the existing tiles and shower rails, the problem became obvious. Issues like this often look worse than they are, and after a quick meeting with a local roofer we found a solution; remove the beam and re-cement the joinery between the two extensions. The big win for me this week was the removal of our wall in the living room. I was unsure whether it would or wouldn’t be possible to do this without the use of a steel, but after a visit from a brilliant local structural engineer, Tarik Beshai, we discovered we could remove the wall as long as we left a 300mm buttress. On the spot decisions have to constantly be made when developing properties, which can be stressful and time consuming, but when you see fantastic results like this it’s well worth it!